❒ In 1923 G. N. Lewis proposed a theory that significantly broadened the understanding of acids and bases. 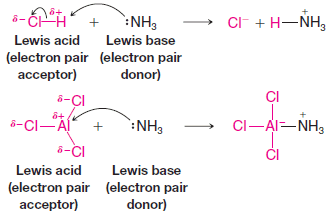 ❒ As we go along we shall find that an understanding of Lewis acid– base theory is exceedingly helpful to understanding a variety of organic reactions. Acids: are electron pair acceptors. Bases: are electron pair donors. 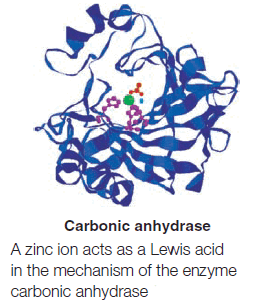 ❒ In Lewis acid–base theory, proton donors are not the only acids; many other species are acids as well. Aluminum chloride, for example, reacts with ammonia in the same way that a proton donor does. ❒ In the reaction with hydrogen chloride above, notice that the electron pair acceptor (the proton) must also lose an electron pair as the new bond is formed with nitrogen. This is necessary because the hydrogen atom had a full valence shell of electrons at the start. On the other hand, because the valence shell of the aluminum atom in aluminum chloride was not full at the beginning (it had only a sextet of valence electrons), it can accept an electron pair without breaking any bonds. The aluminum atom actually achieves an octet by accepting the pair from nitrogen, although it gains a formal negative charge. When it accepts the electron pair, aluminum chloride is, in the Lewis definition, acting as an acid. ❒ Bases are much the same in the Lewis theory and in the Brønsted–Lowry theory, because in the Brønsted–Lowry theory a base must donate a pair of electrons in order to accept a proton. ❒ The Lewis theory, by virtue of its broader definition of acids, allows acid–base theory to include all of the Brønsted–Lowry reactions and, as we shall see, a great many others. ❒Most of the reactions we shall study in organic chemistry involve Lewis acid–base interactions, and a sound understanding of Lewis acid–base chemistry will help greatly. ❒Any electron-deficient atom can act as a Lewis acid. Many compounds containing group IIIA elements such as boron and aluminum are Lewis acids because group IIIA atoms have only a sextet of electrons in their outer shell. ❒Many other compounds that have atoms with vacant orbitals also act as Lewis acids. Zinc and iron(III) halides (ferric halides) are frequently used as Lewis acids in organic reactions. Write an equation that shows the Lewis acid and Lewis base in the reaction of bromine (Br2) with ferric bromide (FeBr3). Reference: Organic chemistry / T.W. Graham Solomons , Craig B.Fryhle , Scott A.snyder , / ( eleventh edition) / 2014.